"Aaron and Jonathan are an amazing duo and one that I highly recommend to all my wedding clients. Their sound is perfect for a wedding cocktail hour, reception or event of any kind. Their energy and enthusiasm for what they do is contagious. Ja2M has a wide selection of songs from different genres of music. I can't say enough about Ja2M, I love these guys!" "I had the opportunity to meet and work with Aaron and Jonathan last year and was totally blown away by their sound. Not only are they super talented but they are really laid back, easy to work with and go above and beyond to make your event extra special. I can't think of anyone I would recommend more." "We wanted so badly to have a live band for our wedding but it just wasn't in the cards. We settled with a DJ instead (for the reception) but still wanted to add something special to our cocktail hour to make it laid back but memorable. 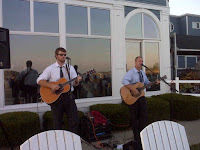 Hiring Ja2M to play for our cocktail hour was honestly one of the best decisions we made - our guests absolutely loved it and they were the perfect fit for our wedding. They were so amazing to work with - from song requests, to showing up promptly and setting up in just the right spot - I have recommended them to everyone in the area and will continue to do so! Thank you Jon & Aaron for making our wedding day that much more special." "Having JA2M play during the cocktail hour for our 2010 wedding was one of the best decisions we made in our wedding planning. They were incredibly easy to work with, eager to learn any requests we had to help make our day even more special, and sounded great! Our guests still comment on how great they sounded and what a wonderful touch it was to the day. Without a doubt we would recommend them to anyone/everyone!"